Received: August 20, 2018; Revised: September 17, 2018; Accepted: September 18, 2018.; Published online: February 5, 2019. Surgical management of interrupted aortic arch (IAA) with systemic outflow tract obstruction is clearly a challenge. If both ventricles are adequate, the Yasui operation is a useful option. Otherwise, a staged approach through initial hybrid palliation and delayed biventricular repair, tailored to the degree of obstructed outflow, serves to avoid a high-risk neonatal procedure. Herein, we present a patient with IAA and severe systemic outflow tract obstruction whose treatment involved hybrid palliation, followed by a Yasui operation. The Institutional Review Board of Seoul St. Mary’s Hospital approved the present case report and waived the need for patient consent (IRB approval no., KC18ZESI0600). A female newborn, delivered at 37 weeks and 4 days (weight, 2.95 kg) was admitted to neonatal intensive care unit of Seoul St. Mary’s Hospital for planned postnatal care. 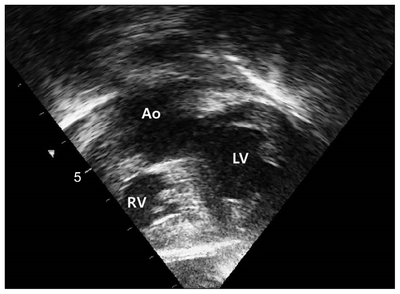 Fetal echocardiography showed an interrupted aortic arch (IAA) and a double outlet right ventricle with a doubly committed ventricular septal defect. Prostaglandin E1 infusion and mechanical ventilation were immediately instituted. Postnatal echocardiography verified the above findings and confirmed the presence of 2 adequate ventricles. The aortic valve was tricuspid and thickened, with a 4-mm annulus (Z-score: −4.9) (Fig. 1). Computed tomography (CT) showed IAA type B, with an aberrant retroesophageal right subclavian artery. Furthermore, the patient displayed a chromosomal anomaly (22q11.2 deletion). Given the severity of systemic outflow tract obstruction, conventional repair of IAA and closure of the ventricular septal defect seemed unsuitable in this case. After multidisciplinary deliberation, the consensus operative strategy called for bilateral pulmonary artery (PA) banding and ductal stenting as a hybrid procedure, thereby avoiding a high-risk neonatal intervention (to address the systemic outflow tract obstruction) and allowing time for potential self-remedial growth. The hybrid procedure was performed 10 days after birth in a specially-equipped suite. Bilateral PA banding was done first, utilizing 3.5-mm polytetrafluoroethylene vascular grafts (Gore-Tex; W L Gore & Associates Inc., Flagstaff, AZ, USA). Ductal stenting was performed by pediatric cardiologists, who inserted a balloon expandable peripheral vascular stent (8×19 mm, Omnilink Elite; Abbott Vascular, Santa Clara, CA, USA) through a purse-string suture of the proximal main PA. Postoperative arterial oxygen saturation was measured at approximately 88% on room air, and the patient was extubated on the first postoperative day. There were no postoperative complications, and the patient was discharged 15 days after the procedure. Daily aspirin (15 mg) was prescribed for anticoagulation. In the interim, there were no complications. At 10 months of age (body weight, 6.6 kg), the patient was re-admitted for second-stage surgery. Arterial oxygen saturation remained at approximately 80%. CT images confirmed patency of the ductal stent, as well as the adequacy of the PA banding and absence of distal migration (Fig. 2). 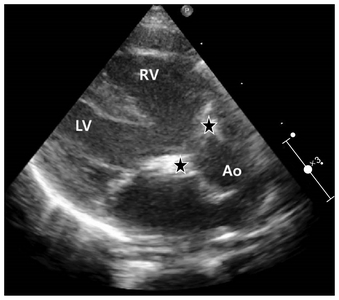 Echocardiography showed a 6-mm annulus of the aortic valve (Z-score: −3.6), with a mild degree of pulmonary regurgitation due to main PA root dilatation. Because the aortic valve was deemed too small to ensure normal cardiac output after conventional repair, we decided upon a Yasui (Norwood-Rastelli) procedure. Surgery was performed under dual arterial and bicaval cardiopulmonary bypass. The right common carotid artery was cannulated directly, and due to the ductal stent, the descending aorta was cannulated just above the diaphragm to perfuse the lower body. After removing the PA bands, the PA confluence was separated from the ductus and the main PA. Balloon dilatation and angioplasty using bovine pericardium (PERIBORN; TaeWoong Medical, Gimpo, Korea) then proceeded at the right and left PA banding sites, respectively. Then, anastomosis between the PA confluence and a 14-mm bovine jugular vein graft (Contegra; Medtronic Inc., Minneapolis, MN, USA) was carried out. After cardioplegic arrest, left ventricle-to-PA intraventricular tunneling was performed through a right ventricular incision, using bovine pericardium. Enlargement of the ventricular septal defect was unnecessary. The dilated main PA root was repaired by wedge excision of 2 sinuses of Valsalva. Norwood-type aortic arch reconstruction was undertaken using a non-valvular segment of bovine jugular vein as patch material under selective cerebral perfusion (via the right common carotid artery) and continuous lower body perfusion (via the descending aorta). The aberrant retroesophageal right subclavian artery was preserved. A proximal anastomosis of the right ventricle-to-PA conduit was then completed. The cardiopulmonary bypass time was 323 minutes, with an aortic cross-clamp time of 158 minutes. The patient was extubated on the first postoperative day. Despite various postoperative complications, including left diaphragmatic palsy, upper gastrointestinal bleeding, and respiratory insufficiency (requiring reintubation), discharge occurred 56 days later. Pre-discharge echocardiography showed good aortic arch flow, no left ventricular outflow tract obstruction (LVOTO), mild neoaortic valve regurgitation, good flow via the right ventricle-to-PA conduit and branch PA, and good systolic function of both ventricles (Fig. 3). LVOTO remains an important factor affecting survival rates and re-intervention rates after IAA repair . Tchervenkov et al. advised a conservative approach if the diameter of the left ventricular outflow tract (LVOT) exceeds the baby’s weight +2 mm. A LVOT bypass procedure (Yasui or Norwood) is instead recommended if the LVOT diameter (mm) is less than the baby’s weight. They suggested an individual approach based on the surgeon’s experience and overall philosophy if the LVOT diameter falls between those 2 cutoff values. Hirata et al. recommended a LVOT bypass if the diameter of aortic annulus is less than the patient’s weight +1 mm. Based on these fundamental principles, conventional repair of IAA and closure of the ventricular septal defect seemed unsuitable for our patient. The mortality of IAA repair with LVOT bypass is high, even at tertiary centers. Kanter et al. reported outcomes after biventricular repair of IAA with LVOTO by a Yasui operation in 13 patients, of whom 2 underwent primary repairs and 11 underwent staged procedures, starting with Norwood repair. There was 1 (7.7%) operative mortality after staged repair, and 3 late deaths followed (staged group, 2; primary repair group, 1). All 4 deaths involved patients with genetic syndromes (DiGeorge syndrome, 3; trisomy 22, 1). Nakano et al. recorded 1 (5.9%) operative death in a group of 17 patients with adequate-sized ventricles and ventricular septal defects, associated with aortic arch obstruction or LVOTO, who underwent a Yasui operation. Carrillo et al. reported a 6.7% operative mortality rate in 18 patients undergoing a Yasui operation for critical aortic stenosis or atresia, hypoplastic aortic arch, and a well-developed left ventricle with a ventricular septal defect. We believe that the risk of neonatal Yasui operations may be greater at low-volume surgical centers. As Nakano et al. have noted, bilateral PA banding is useful as an initial palliative procedure in symptomatic neonates with LVOTs of marginal size, because it is less invasive than a Norwood procedure, and it allows surgeons to entertain either a Yasui operation or a standard biventricular repair, based on subsequent LVOT growth. A hybrid procedure incorporating bilateral PA banding and ductal stenting may be even more useful, because there is no need for continuous prostaglandin therapy after uneventful placing of stents, and the patient may be readily discharged. Uno et al. have detailed successful hybrid palliation in a series of 6 patients with IAA and aortic stenosis, witnessing no mortality or severe morbidity. They observed growth of the aortic valve in 4 patients, and 2 patients eventually underwent conventional biventricular repair, confirming that hybrid palliation helped not only avoid high-risk neonatal surgery, but also facilitated the eventual selection of second-stage surgery based on the interim development of left ventricular structures. Although the current patient failed to exhibit sufficient left-sided structural development for conventional biventricular repair after hybrid palliation, the staged approach afforded time for the patient to grow and enabled more thoughtful decisions on optimal management. In addition, a larger right ventricle-to-PA conduit could be implanted at the time of the Yasui operation, given the patient’s somatic growth. Indeed, this may be another benefit of staged (versus primary) Yasui operations. In conclusion, for patients with IAA and systemic outflow obstruction, initial hybrid palliation that includes bilateral PA banding and ductal stenting may be a viable alternative to a primary Yasui operation, especially in high-risk scenarios. Fig. 1. Parasternal long axis view illustrating the small aortic valve annulus (black asterisks). LV, left ventricle; RV, right ventricle; Ao, aorta. Fig. 2. 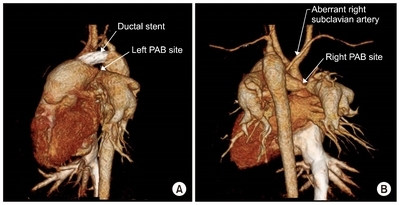 Computed tomography obtained 10 months after hybrid palliation, showing the intact ductal stent and bilateral pulmonary artery banding. (A) Left view. (B) Posterior view. PAB, pulmonary artery banding. Fig. 3. Subcostal left anterior oblique view confirming a widened left ventricular outflow tract after the Yasui operation. LV, left ventricle; RV, right ventricle; Ao, neo-aorta. Schreiber, C, Eicken, A, and Vogt, M (2000). Repair of interrupted aortic arch: results after more than 20 years. Ann Thorac Surg. 70, 1896-9. Tchervenkov, CI, Jacobs, JP, Sharma, K, and Ungerleider, RM (2005). Interrupted aortic arch: surgical decision making. Semin Thorac Cardiovasc Surg Pediatr Card Surg Annu, 92-102. Hirata, Y, Quaegebeur, JM, Mosca, RS, Takayama, H, and Chen, JM (2010). Impact of aortic annular size on rate of reoperation for left ventricular outflow tract obstruction after repair of interrupted aortic arch and ventricular septal defect. Ann Thorac Surg. 90, 588-92. Kanter, KR, Kirshbom, PM, and Kogon, BE (2012). Biventricular repair with the Yasui operation (Norwood/Rastelli) for systemic outflow tract obstruction with two adequate ventricles. Ann Thorac Surg. 93, 1999-2005. Nakano, T, Kado, H, and Tatewaki, H (2014). The Yasui operation for patients with adequate-sized ventricles and ventricular septal defect associated with obstructions of the aortic arch and left ventricular outflow tract. Eur J Cardiothorac Surg. 45, e166-72. Carrillo, SA, Mainwaring, RD, and Schaffer, JM (2015). Contemporaneous comparison of the Yasui and Norwood procedures at a single institution. J Thorac Cardiovasc Surg. 149, 508-13. Uno, Y, Masuoka, A, Hotoda, K, Katogi, T, and Suzuki, T (2017). Hybrid palliation for interrupted aortic arch with small aortic valve. World J Pediatr Congenit Heart Surg. 8, 332-6.